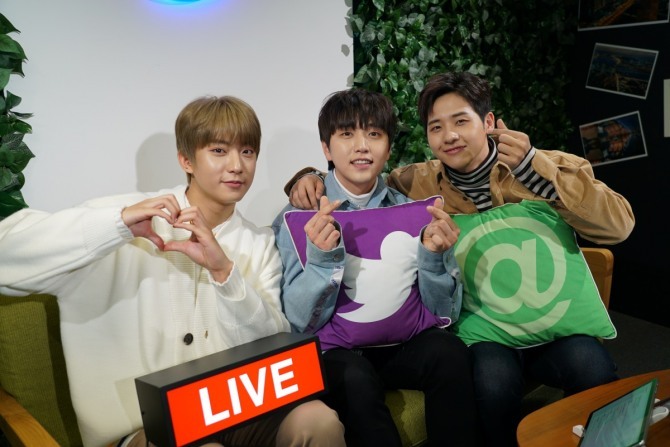 K-pop boy band B1A4 met with fans at Twitter Blueroom live session at 2 p.m. on Tuesday, with the hourlong Q&A show exceeding 500,000 viewers. The trio is the first to hit the social media giant’s flagship live broadcast this year, held at Twitter Korea’s iconic headquarters situated on the 41st floor of a skyscraper in Gangnam, southern Seoul, capturing the city’s skyline. It was also a memorable moment for the band, as CNU will leave to begin his mandatory military service next week. 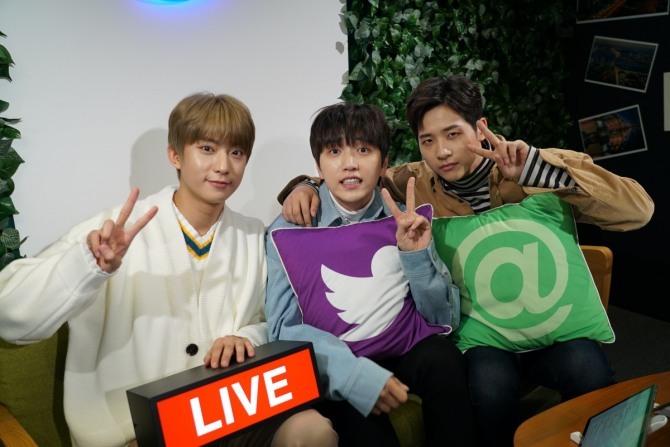 With excitement, CNU, Sandeul and Gongchan arrived to the forest-themed studio to answer all the questions the fans, better known as “BANA,” had posted to the band’s Twitter account earlier and during the live show. The band got comfortable on the couch, hugging the Twitter logo cushions, while answering various questions. Fans asked where the band would like to travel. “I want to go to Kawasan Falls (in the Philippines), where we can jump off a cliff and swim in the beautiful area,” said Sandeul. Gongchan said he preferred to travel abroad by himself. When asked about their favorite fruits, CNU answered watermelon, while Gongchan likes tomato. Sandeul loves all fruits, but narrowed his choice down to the apple mango. Thirty minutes in, B1A4’s live show had hit 220,000 viewers, as the band celebrated with hand gestures and thanked fans for their support. Sandeul revealed he has a hard time memorizing new lyrics, so he works extra hard by practicing every day until he can sing the lyrics through 10 times without a single mistake. What is on their playlist these days? The bandmates also revealed that they search for their own names on the internet frequently. Gongchan said he is in love with Twitter for communicating with fans on the platform. 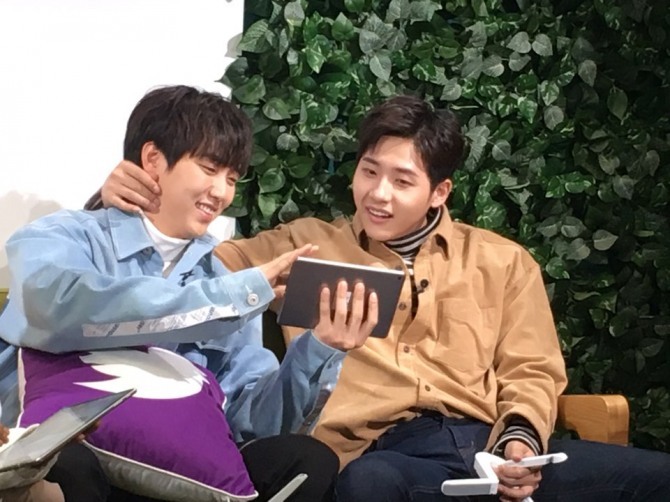 Sandeul complained about difficulties finding his pictures online because when he searches his name, pictures of mountains (san) and fields (deul) appear instead. So he asked his fans to affectionately call him “samdol” from now on. 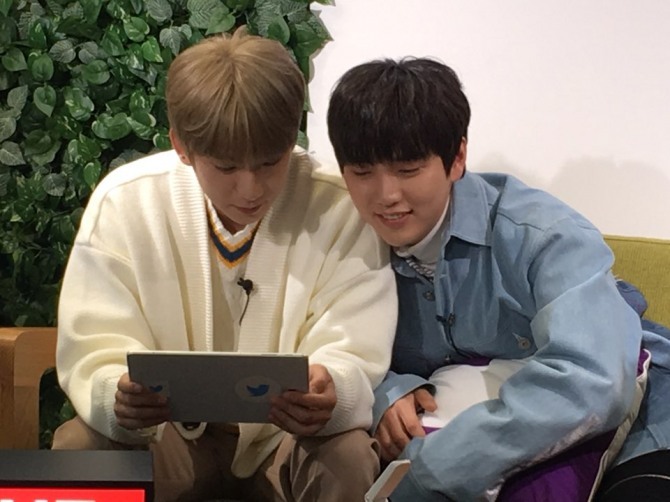 Sandeul changed his profile name to “Samdol” and the hashtag #samdol was trending on Twitter immediately after the broadcast. Fans expressed their disappointment as it would be a while for the trio to appear on the screen together, as CNU begins his mandatory military service on Jan. 22. “As many of you already know, I am entering military service next week. Meanwhile, please send your love to Sandeul and Gongchan and I will return in good health,” said CNU. 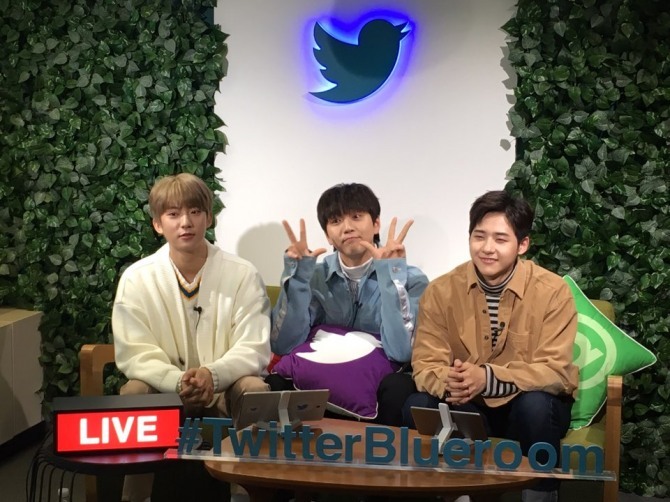 B1A4’s Blueroom live broadcast can be viewed again via the band’s official Twitter account, @B1A4Official. Kpop Herald is the official media partner for the livestreaming show. Visit our Twitter account, @Kpop_Herald, for behind-the-scene clips, exclusive photos and stories.